Commonwealth Avenue has grown quite a bit since 1999. What was then a quiet street with few booming businesses and some older buildings in disrepair, has undergone a transformation that has seen the opening of many bars, restaurants, and shops that have earned this avenue the name Bourbon Street West. If you’ve visited Fullerton, CA recently, you likely spent time on Commonwealth. What you probably didn't realize, is at 1415 W. Commonwealth Avenue you will find the number one Yelp rated storage facility in Fullerton. Built in May 1999, the facility features 1,031 storage units of varying sizes. 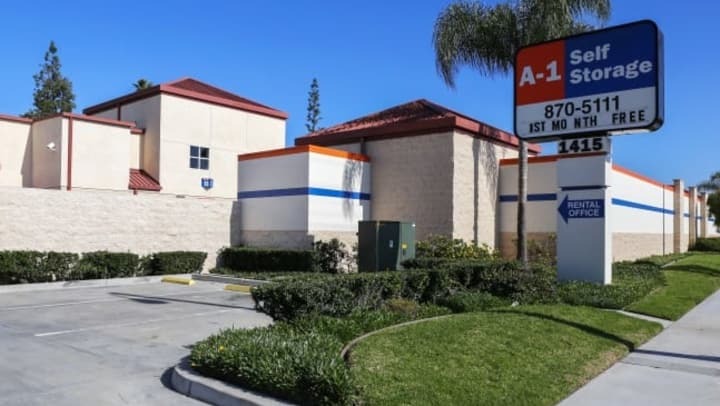 A-1 Self Storage is proud to have this facility as one of its more than 50 locations in California. We had the opportunity to speak with Melissa, the manager of this location, to get the scoop on everything they have to offer. While the influx of new businesses over the years has certainly been very beneficial to this location, residential customers comprise roughly 80% of the community, according to Melissa. With so many individuals and families utilizing storage, A-1 Self Storage includes a fully-stocked moving supply store in the office to provide people with items they may not have realized they needed. When people are storing their belongings, security is a top concern. This facility has 24-hour surveillance cameras and individual alarms in every single unit. The more than 1,000 units are spread across two stories, which can be accessed conveniently using one of three separate elevators. There are push carts available for anyone moving large items. If anyone is looking to store a vehicle, this location also has about 100 drive-up units for that exact purpose. As far as accessibility goes, one would be hard pressed to find a storage facility with more open hours than this one. Melissa and her team members, Brittini and Polette, work together to create a fun and supportive environment. Their customer service is the primary reason so many overwhelmingly positive reviews keep coming in. If you are looking for storage in Fullerton, what left is there to consider? Stop in and say “Hi” to Melissa and the team and have a look around. We’re sure that you will be very happy you decided to trust our team with your storage needs!